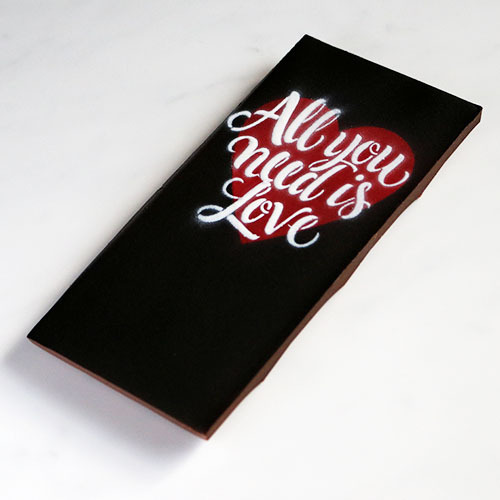 Home / Products / Chocolate / Chocolate Bars / All you need is love….and chocolate. Inspired by graffiti art, our 2019 Valentine’s bar is uniquely decorated by hand with a bold red heart and the words “All you need is Love” against a striking black backdrop. The bar itself is crafted from a very special gianduja-style milk chocolate – super smooth and creamy with a delicious sweetness and the addictive taste of roasted hazelnuts. These beautiful red hearts hide a filling of rich salted butter caramel layered over milk chocolate and hazelnut gianduja. The sea salt in the caramel tempers the sweetness of the sugar, and brings out the wonderful flavour of toasted hazelnuts. 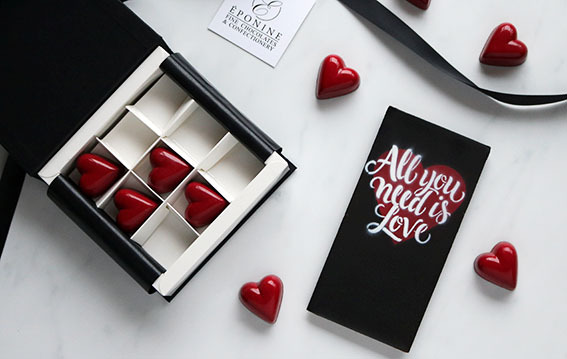 Originally created for Valentine’s Day 2018, they have become popular all year round as the perfect romantic chocolate gift. Not nuts about gianduja? Then why not treat your Valentine to one of our other beautiful chocolate selections, all available in our online shop. Please remember to place your Valentine’s Day gift orders by the end of Sunday 10th February or it may not arrive in time. 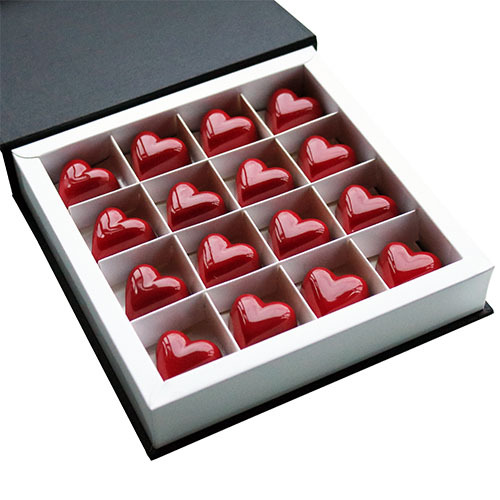 You can also select “Valentine’s Delivery” and your order will be dispatched from 6th February to ensure that your chocolates are as fresh as possible. Subscribe to the Éponine Newsletter by clicking the button below and be the first to hear about new products like this, along with special offers, promotions and exclusive competitions throughout the year. Clicking on the button will open a new window or tab to take you to our signup form.